Alan Dent, (1905- ?) born in Maybole, quotes he was born there because his north-country parents had chosen to go and live there for the reason that it was in the heart of the Burns Country. His mother died when he was only two years old. But his father brought him up to love poetry and music, and read to him Burns (as well as Shakespeare, Tennyson and Whitman) even before he had learned to read and write. 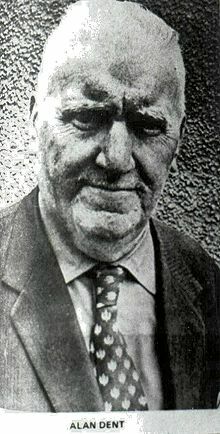 Educated at Carrick Academy he went to Glasgow University aged only 16, in 1921 and, after making a false start in medicine, did well in English, French and Italian; but left for London in 1926 without securing a degree. He became a dramatic critic the hard way, apprenticing himself to a master of the craft, James Agate, for 15 years in all. He was London critic of The (Manchester) Guardian from 1935 till 1943, and dramatic critic of the News Chronicle from 1945 till its sudden demise in 1960. He worked in broadcasting and was the regular film critic of the Illustrated London News. He was the text-editor and text-adviser of Sir Laurence Olivier's three Shakespeare films, Henry V, Hamlet, and Richard III, and he celebrated the quarter-centenary by publishing a quiz book called How Well Do You Know Your Shakespeare? He did a five month tour of America in 1953-4 and returned to America (1966-7) to lecture on "The Fine Art of Criticism" at Toronto, Harvard, Yale, and New York. Amongst other publications are Preludes and studies, Nocturnes & Rhapsodies, My Dear America, The Life of Mrs. Patrick Campbell. The great loves of his were Shakespeare and Max Beerbohm, Hardy and Dickens, Mozart and Bach, and of course Robert Burns. In 1960 he was living in Beaconsfield, Bucks. Description of the tobacco shop "Dents" in Maybole owned by Alan's father. AN UNEXPECTED WINDFALL in the shape of a 3,000 volume library will be coming Carrick Academy’s way some time in the future. The gift is the private collection of books of well-known author and drama critic Alan Dent who met the rector of his former school, Mr David Conn, last week and made the offer. Alan, who has been making sentimental journey to his native town from his home in Beaconsfield, Buckinghamshire, was pleased to discover that Mr. Conn is also a South Ayrshireman and comes from Colmonell. When the two men met in the school last week it was the first occasion that Alan had set foot in the present school. His school career began in 1910 in the former Carrick Academy which was in the heart of the town and which was destroyed by fire in 1919. One of the many books, which were lost in that fire was a one-volume copy of Shakespeare’s, works which was one of Alan’s most treasured possessions. That book was the spark, which kindled a lifelong interest for Alan in the Bard of Avon, and he was possibly written more than any other living writer about Shakespeare. But he has managed to crowd into his 69 years a few other interests. After studying medicine at Glasgow University in the 1920s he went to London and there began a writing career, which made him one of the foremost drama critics of his time. He worked for many years as secretarial aid to the late James Agate who was one of Fleet Street’s literary giants in the 1920s and 1940s. Agate, who died almost exactly 27 years ago, is remembered by many as the book reviewer of the Daily Express, but for Alan Dent he was the man who encouraged him, if encouragement were needed, towards an even deeper interest and study of the works of William Shakespeare. In his journalistic career Alan was for many years the film critic of the London Illustrated News. But it is as drama critic of the now defunct News Chronicle that he is best known. In his News Chronicle days he used to make a pilgrimage each summer to his native town of Maybole to renew old acquaintances while visiting the Edinburgh Festival for his paper. Books galore have, come from Alan’s gifted pen. There have, been books on famous theatrical personalities like Mrs. Patrick Campbell and Vivien Leigh, but mostly he has written on the absorbing interest of his life, the man who, like Saint Paul, was said to be all things to all men —William ‘Shakespeare. Now is his 70th year Alan confesses that it is rather more difficult for him today to create the mood and the atmosphere for creative writing work. He feels like the Roman statesman, soldier and ‘author, Cato who regretted only three things in his life — that he had ever travelled by sea when he could have gone by land; that he had ever trusted a woman with a secret; and that he had gone a day longer than necessary without making out his will. Alan has made out his will and it includes the gift of his well-loved library to his old school. But ‘he has jokingly warned Mr. Conn that It may be the year 2000 before Carrick Academy eventually receives the books. When the Dent Collection eventually finds its way into the school at Kirkoswald, Road it will form the heart of a school library, which few towns in Ayrshire can rival. "The opening allegro took me straight back to childhood and gave me in turn the rusty windlass of a well, the interlinking noises of a goods train that is being shunted, then the belly rumbling of a little boy acutely ill after a raid on an orchard, and finally the singular alarmed noises of poultry being worried to death by a scotch terrier. The second movement gave me continuously and throughout its short length the noise of a November wind in telegraph poles on a lonely country road. The third movement began with a dog howling at midnight, proceeded to imitate the regurgitations of the less refined or lower-middle-class type of water closet cistern, modulating thence into the mass snoring of a naval dormitory around the dawn, and concluded inconsequentially with the cello reproducing the screech of an ungreased wheelbarrow. The fourth movement took me straight back to the noises I made myself, on wet days indoors, at the age of six, by stretching and plucking a piece of elastic. And the fifth movement reminded me immediately and persistently and vividly of something I have never thought of since the only time I heard it: the noise of a Zulu village in the Glasgow Exhibition, a hubbub all the more singular, because it had a background of skirling highland bagpipes. Both noises emerged in this final movement of this Fourth Quartet of Béla Bartók." DIRECTOR: Laurence Olivier, Reginald Beck; PRODUCER: Laurence Olivier, Filippo Del Giudice; SCREENPLAY: Alan Dent, Laurence Olivier; STUDIO: Rank; VIDEO: Paramount; RUNNING TIME: 127 mm. HENRY V. Alt. title: THE CHRONICLE HISTORY OF KING HENRY THE FIFT. U.K. Two Cities, 1944. Dir/prod: Laurence Olivier. Photo: Robert Krasker. Mu: William Walton. Text ed. : Alan Dent. Cast: Laurence Olivier, Robert Newton, Renee Asherson, Felix Aylmer. 3 cassettes, ca. 137 min., sd., color, 3/4" Videocassette. VBB 3375-3377 4 reels, ca. 137 min., sd., color, 16mm Reference print. FDA 1849-1852 Adapted from the first folio edition of Shakespeare's play performed in 1600, The Chronicle History of King Henry the Fifth with his Battell Fought at Agincourt in France. Hamlet (Universal, 1948). Director: Laurence Olivier. Writer: Alan Dent, adapted from William Shakespeare. Cast: Laurence Olivier, Eileen Herlie, Basil Sydney, Jean Simmons. (153 min., sd., b&w, 35mm; LC Collection, courtesy Universal). Laurence Olivier’s assured adaptation of Shakespeare’s tragedy of the Danish prince who is driven to avenge his father’s murder. The dead king and the usurper become positive and negative aspects of the father figure. Olivier amplifies the Oedipal nature of the troubled Dane’s predicament by dwelling on the carnal kisses which Hamlet exchanges with his mother, making the film a clear example of how Freud has influenced our reading of familiar texts. A postcard postmarked London SW1 and dated 30th March 1965 and addressed to: Alan Dent Esq 85 Aylesbury End Beaconsfield Bucks from Vivien Olivier, sign Vivien. The message reads: Tues Hello-How thoughtful of you-v. nice indeed. I found it. How happy I would have been to see you at A????maque!! How happy I shall be when I see you again. Love ever Vivien. Vivien Leigh (November 5, 1913–July 7, 1967) was an English actress who was born Vivian Mary Hartley in Darjeeling, India. She and her parents later moved to England, where young Leigh grew up. She attended the Convent of the Sacred Heart in Roehampton, England, along with fellow actress-to-be Maureen O'Sullivan. She was married in 1932 to Herbert Leigh Holman, and they had a daughter, Suzanne, in 1933. Leigh's career began on the stage. Her first play was The Green Sash, though it was Mask of Virtue that really brought her to stardom. In 1935, she began her film career with such movies as The Village Squire, Things are Looking Up, and Look Up and Laugh. Leigh is best known, however, for her role of Scarlett O'Hara in the American film Gone With the Wind (1939), for which she won an Academy Award for Best Actress. In 1940, Leigh arranged for a divorce from Holman and married British theatre star Laurence Olivier. The actress died of chronic tuberculosis in her London home. She was cremated and her ashes were scattered on the lake at Tickerage Mill, near Blackboys, Sussex. Leigh has a star on the Hollywood Walk of Fame at 6773 Hollywood Blvd.